The engineers on the other side of the video conference call were getting more and more frustrated. “You can’t even tell us what shape it is,” they cried. The project had been running for a few months and even though we had made a lot of progress in the early design, they were right; we were not certain what shape it was yet. One engineer compared the process to designing an aircraft; “At least we’d know what shape it is”, presumably negating the possibilities of biplanes, triplanes, flying wings, rotary-wing and many others yet to be dreamt up. There is a fundamental problem in designing anything new. On the one hand you want to make decisions quickly so as to speed up the development process and gain certainty on important issues such as practicality, cost, market acceptance, etc. On the other hand you want to leave possibilities open for as long as possible so that you can respond to new opportunities as you discover them, or as the market evolves. During the 1980s I was lucky enough to study in Professor Bruce Archer’s Department of Design Research at the Royal College of Art. Bruce was very keen on the notion of “Design” being seen as distinct from “Science” or “Arts”. I think about new product development process as being a design activity. We start out with a “need” but very little idea of what that “practicable result” will be. In my experience we have to discover possible design solutions through exploration. This process requires us to test decisions in order to explore this landscape of possibilities. This means that indecision will stall the process, but the ability to overturn a decision is equally important when you discover you’ve gone up a blind alley. Now we all know that we should involve a cross functional team in the NPD process as soon as possible, but what happens, as in this case, when members of that team are uncomfortable with the uncertainties inherent in the early stages of it? Back to that non-airplane (maybe it’s a hovercraft or a videoconferencing system): the product was going to be vital for the future of the company and had to meet a complex but woolly set of objectives: “look a million dollars”, “do everything the old one did”, “really wow the market”, and one concrete one: “cost half of the current unit”. The designers were getting towards the end of the early stages of the project. The physical look of the product was starting to emerge, though we’d yet to fully achieve that “wow” factor when we tested it in the market, so we knew we had more work to do. Now was the time to really engage the engineering team to get their help in achieving the “wow”. The trouble was that at this transition stage we were confident about a lot of things, but some were still up in the air. That was why we wanted the engineers on board to help us pin down some of those variables. It was at that moment that we hit the “hole in my bucket” problem. There are many reasons for getting stuck at an impasse; no information to make the decision upon, too much information to make sense of, difficulty on deciding what information is most important, fear of the consequences of either decision, or perhaps the comfort of stasis. Then there is the “hole in my bucket” problem. When I was a child there was a popular song which started “There’s a hole in my bucket, dear Liza, dear Liza.” In order to fix the hole Liza needs straw, to cut the straw she needs an axe and to sharpen the axe she needs water, for which she needs the bucket. So often we get stuck in these infinite loops of logic when trying to design something new. Some of us will want to analyse the situation methodically, and this can be helpful, up to a point. The difficulty with analysis is knowing when to stop. The detail driven guys on the team are likely to keep going until they hit the atomic level. This analysis is research to inform your decision. 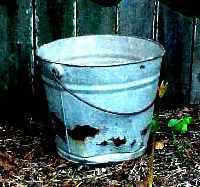 Those cases that defy analysis require a different approach, one of imagining what is not there, or when your analysis simply takes you in a circle, you discover that what you need to mend your bucket … is a bucket. What you need to do is to continue to drive the process forward, even as you are going through iterative loops. You will discover much whichever fork in the road you take at this moment of indecision, so be radical and take any. Literally toss a coin. The engineers are likely to freak out, but it is a strong signal that the team is stuck. Take the decision to investigate that route thoroughly for a limited amount of time before deciding whether to investigate the other fork as well. “The last thing one discovers in writing a book is what to put first”. This entry was posted in create and tagged design, development, ideas, product, product definition. Bookmark the permalink.